You can whip up this play kitchen in no time with Anna Wulick’s recipe/design plans available at her Etsy shop, Fortytworoads. 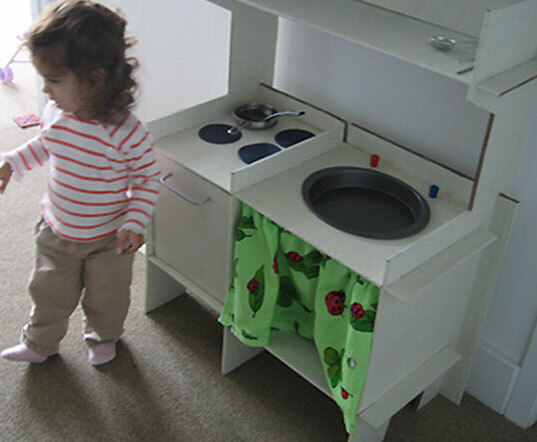 She’ll email you her fourteen page instruction kit as a PDF file, and you’ll be on your way to fashioning this sturdy kiddie kitchen out of recycled cardboard, wire hangars, and odds and ends found around your house. No nails, screws or glue are required… just a dash of ingenuity. The finished product stands at 38 inches high, with a 22 inch counter height and a 30 inch width, making it the perfect workspace for a toddler to pre-school sized chef looking to cook up some fun. As an architect mom I LOVE this creative and eco-friendly DIY idea and design! Kudos to the designer! Love, love, love it! Thanks for posting this awesome idea! Reusing is even better than recycling and I wish I knew about this earlier. The most I've done with cardboard is filling boxes with old magazines and making steps for the kids to climb on. You can whip up this play kitchen in no time with Anna Wulick's recipe/design plans available at her Etsy shop, Fortytworoads. She'll email you her fourteen page instruction kit as a PDF file, and you'll be on your way to fashioning this sturdy kiddie kitchen out of recycled cardboard, wire hangars, and odds and ends found around your house. No nails, screws or glue are required... just a dash of ingenuity.